The Victoria Chapter supporting postal workers and the right to strike. 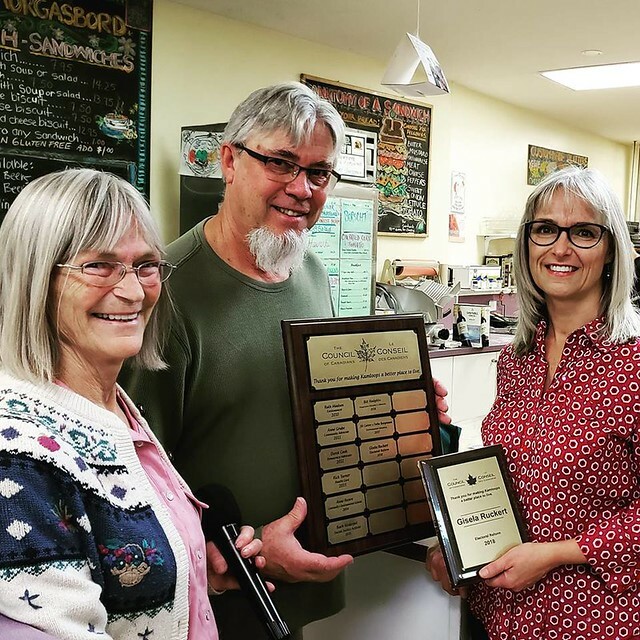 Kamloops Chapter presenting an award to Gisela Ruckert in honour of Fair Vote Kamloops. Ottawa Chapter took part in a powerful gathering on Parliament Hill in Ottawa on December 7 demanding mercury justice for #GrassyNarrows. 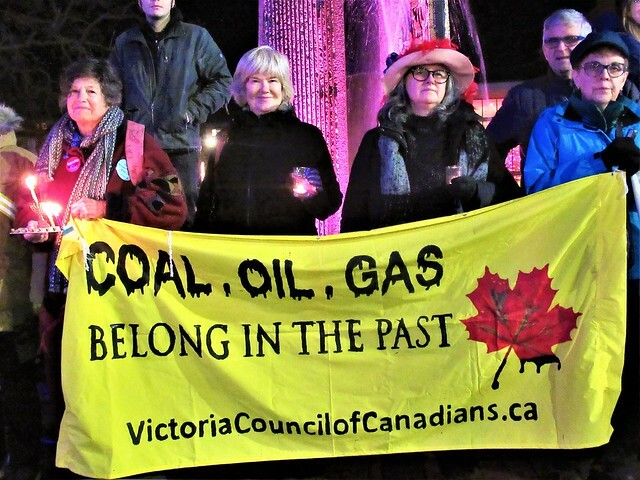 Victoria Chapter, Night on The Blue Bridge Bridge Sit-in and Vigil for a Liveable Climate Future. there is a chapter near you and if not, contact us to discuss starting one! Along with 10 other organizations, the Regina Chapter, Saskatoon Chapter, and the Prairies-NWT Regional Office applied to be intervenors in the Saskatchewan government’s lawsuit against the federal government’s carbon pricing legislation, arguing that governments at all levels have a constitutional duty to do more to combat climate change. Moncton chapter joined an anti-fracking demo in Penobsquis, NB on Tuesday following the provincial government’s announcement that the fracking ban will be lifted in the Sussex area. Chapters across the country have been standing with CUPW postal workers. Join People.4.PostalWorkers on Facebook to see photos and see events in your community. The NWT Chapter sent in a letter of comment on the Government of the Northwest Territories’ climate change plan for 2019-2023, calling out their inadequate action towards a rapid just transition to 100% renewable energy, adaptation planning, or inclusion. 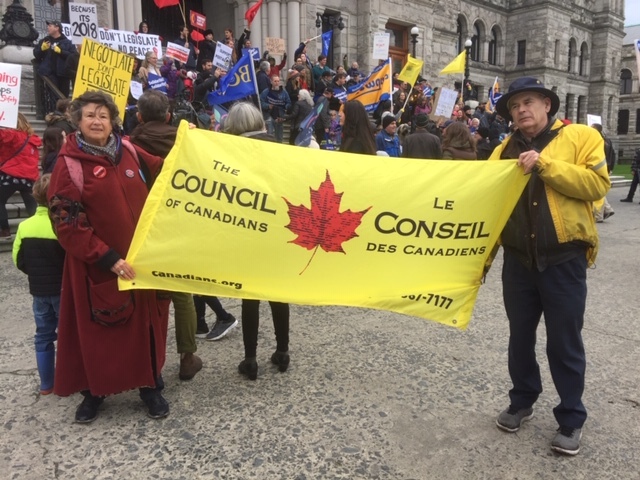 In summary, they said: “In light of the climate threats facing this jurisdiction, we expected an aggressive and innovative Action Plan but this Plan is neither." The NWT Chapter also participated in the Stakeholder and Public Review for Parks Canada’s Draft Action Plan for Wood Buffalo National Park and are encouraging others to take part before the December 10th deadline as well. You can read their submission here. Wood Buffalo National Park is a UNESCO World Heritage site that is being threatened by cumulative development including the tar sands and Site C.